The first story, “The Gatecrasher”, begins when Edward Charlton walks into the shop and takes an instant liking to an antique mirror. The mirror is priced at £250, but Edward assures the dealer that the mirror is only a reproduction and offers him £25, which the dealer accepts. Talk about a steal. When Edward gets the mirror home he throws a party to show it off and it is such a spooky-looking mirror that one guest comments that it looks like something that should be in a medium’s parlour. The reaction to this statement is instantaneous and Edward soon has his friends gathered around a candle for a séance. It might all seem like fun and games at the time, but Edward manages to awaken a rather nasty spirit that is trapped inside the mirror and it soon sends poor, old Ed off on a killing spree. The spirit has been trapped inside the mirror for a very long time, it wants out, and all it needs is blood. Lots and lots of blood. In “Act of Kindness” an ex-soldier, Christopher Lowe, is unhappy with his lot in life. He spends his days working a dead end job and then returns home every night to a wife who hates his guts. Love, honour and obey? This one was probably too busy nagging her groom to even hear that part. home with him and meet his daughter, who turns out to be one seriously weird chick. Needless to say Christopher is soon in over his head and the new lady in his life makes the old one seem like a saint. The third story is called “The Elemental”, and if you want to find out if the buyer does enjoy ‘snuffing it’ this is the one to watch. After he has swindled the dealer out of the snuff box Reginald Warren heads on home, but while he is on the train he is accosted by wonderfully batty clairvoyant, Madame Orloff, who poses the question, “Did you know you have an elemental on your shoulder?” He didn’t, of course. In fact, he has no idea what one is, but Madame Orloff is quick to explain this to the cursed business man and she also tells him that his elemental is a particularly nasty one. 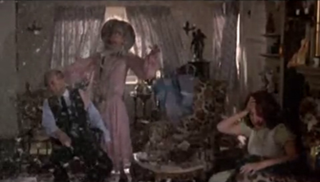 Reginald takes all of this with a grain of salt and a bemused look on his face, but he accepts one of Madame Orloff’s business cards and it is a very good job that he does because it is not long before he requires her services and the exorcism scene that follows is incredibly amusing. Last, but not least, we have “The Door”. Ian Ogilvy stars as William Seaton, who pops into the antiques shop and buys an elaborately carved 16th Century door. It’s not cheap and the purchase cleans him out, but he seems happy enough, even if the door is a bit OTT for a stationary cupboard. But, as William soon discovers, the door does not always open to reveal his paper and pens. Sometimes the cupboard is replaced by a large and creepy, blue room, where something nasty lays in wait, hoping to entice people inside. And if they don’t come in? No matter, it is quite prepared to step out of the room and search them out. “The Gatecrasher” is probably the darkest of the four stories. That guy in the mirror is very creepy-looking and I am sure that he will have caused quite a few nightmares over the years. “The Door” comes a close second though. It is the kind of film that could make you feel nervous—for a little while anyway—about sitting with your back to a door. 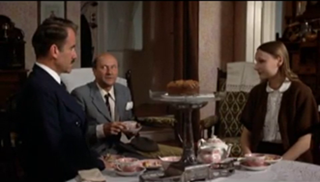 “Act of Kindness” is also pretty dark and if you are a fan of Donald Pleasence you will probably want to see this one. Pleasence plays Jim Underwood, seller of matches and father of the aforementioned ‘seriously weird chick,’ played by his real life daughter Angela Pleasence. Fans of Diana Dors will not be disappointed either. Dors plays the ever-bitchy Mabel Lowe and, for my money, nobody could have done it better. The most amusing story? “The Elemental” wins hands down and Madame Orloff steals the show. 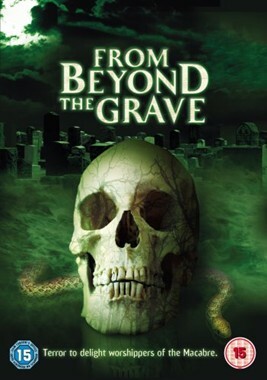 From Beyond The Grave probably won’t be to everyone’s taste. 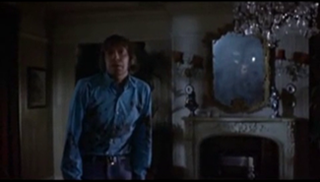 I like it though, and it is probable that any fan of Hammer or Amicus horror movies will also enjoy it. High action? I don’t think so. A bumper bonanza of special effects? A big, fat ‘no’ to that one, but the stories are good and the cast do a wonderful job of bringing them to life. If you haven’t seen this one, and do decide to rent or buy it, keep an eye open for the thief who is stalking the antiques shop between the stories. 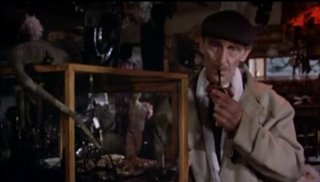 He plucks up the courage in the end, and enters the shop for a bit of general thieving and skulduggery. Getting in is one thing, getting out again is something else entirely. Crime does not pay. It just does not pay, brothers and sisters, especially if you try robbing shops where most of the merchandise comes from beyond the grave.